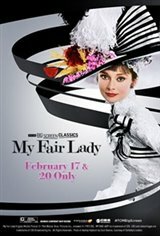 Fathom Events, TCM and CBS are bringing My Fair Lady to select cinemas nationwide for a special two-day event, which includes exclusive insight from Turner Classic Movies. My Fair Lady is now more "loverly" than ever as a result of a breathtaking recent restoration. Audrey Hepburn has never looked more radiant than as Eliza Doolittle who finds herself at the center of a friendly wager between Professor Henry Higgins (Rex Harrison) and his companion, Colonel Pickering (Wilfred Hyde-White). Can this cockney flower girl blossom into a proper lady presentable in high society?